Samothrace is a relatively small island located in north Aegean, southwest of the outfall of river Evros and approximately 50 Km from the port of Alexandroupolis. Samothrace owes its distinct morphology to the imposing mass of Mount Saos of Feggari with highest peak at 1611 meters, as the mountain runs through the entire island. This is the highest peak in the Aegean after the mountains of Crete and Evia, as a result the mountainous Samothrace has a lot of green, running waters and many large waterfalls. Samothrace is known worldwide thanks to the famous statues of Nike of Samothrace, found on the island on 1863 and today graces the Louvre Museum. It is also known from the Kaveiria Mystiria that took place here during the ancient times, making Samothrace one of the most important religious centers of ancient world. Samothrace is a destination for relaxing vacations with little nightlife. The most activity on the island is at Kamariotissa, the harbor of Samothrace, at the west edge of the island. The trademark of Samothrace are the wild goats that are moving around freely all over the island and you can come across them at all times and places. Samothrace only has few beaches but of great natural beauty. The largest part of the island, besides the southeast with its steep and rocky shores, is surrounded by pebbled beaches. The only exception is Pachia Ammos at the south side with nice sand. Kipi (Southeast Samothrace): The largest beach of Samothrace with tall rocks and large gray and black pebbles. 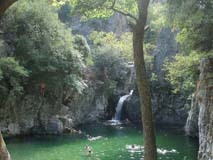 Kremastos (Southeast Samothrace): The largest waterfall of the Mediterranean that flows into the sea from great height. 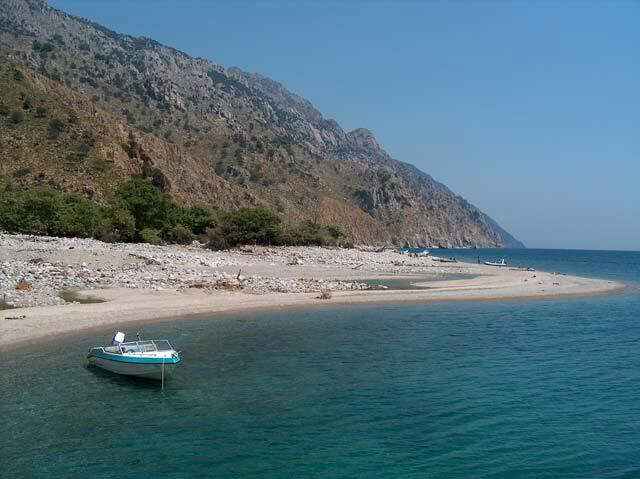 Pachia Ammos (South Samothrace): Pachia Ammos is the only sandy beach of Samothrace. 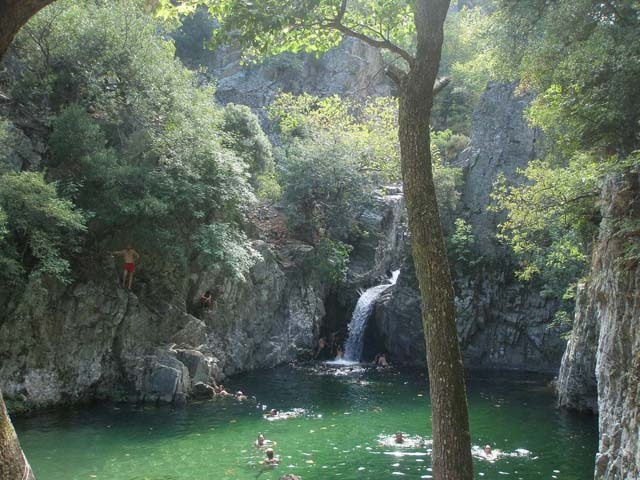 Karkani (South Samothrace): A small and usually empty beach with green water and difficult access. Vatos (South Samothrace): A beach of wild charm with sand and crystal sea. Accessible only by sea. Fonias Beach (South Samothrace): A long beach, nothing special, with pebble and clean sea. Gyali (South Samothrace): A relatively small beach with white pebble and see through green-blue water. 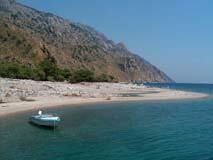 Therma (North Samothrace): An organized beach with pebble and cold water deepens very suddenly. The only way to get to Samothrace is by ferry from the nearby Alexandroupolis, with daily routes from Saos Ferries (http://www.saos.gr/index.php?SCREEN=dromologia) with the trip being 2,5 hours long. Samothrace has a decent road network so it is best to have a car with you, as the local bus routes are not very helpful. In case you do not have a vehicle, you can rent a car or a bike here. In any case make sure you do not leave your can underneath trees, because the cute wild goats that are everywhere will not hesitate climbing on your car in order to reach the leaves of the tree. Most rooms to let of Samothrace are found at the northwest part of the island, in Chora (west), Paleopoli, Karyotes and Therma. All those are at about the center of the island's road network and close to Chora. 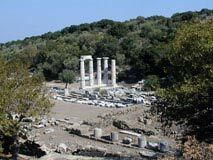 There is limited accommodation on Samothrace so book early, and there are also 2 organized camping sites (a very popular practice on the island) close to Therma. The most famous specialty of Samothrace is its skewered wild goat, which is delicious as the local wild goats roam freely around the island. Naturally there is fresh fish and seafood, while you can also try other local dishes like zucchini flowers and manti (dough pouches stuffed with meat and rice). For dessert ask for haslama, a local syrup sweet. We recommend the Karydies tavern of Miss Ntina at Ano Meria and the taverns of Profitis Ilias, the highest village of Samothrace. Do not miss out on visiting the bakery-attraction of Mr Giannis for Eptazymo bread, as it is a monument operating since 1853! On Samothrace you will find various spoon sweets but favor the ones with flavor kaisi (apricot variety) or praousti (wild plum). You can also buy local products like olive oil, honey, local cheese types like kaskavali (spicy yellow cheese) and myzithra. The Samothrace Archaeological Museum operates in Paleopoli since 1955. One of its many exhibits is a copy of the headless winged statue of Nike of Samothrace. It is located in Chora and besides its rich collection it has a representation of the interior of a traditional house of Samothrace. An amphitheatrically built traditional 15th century settlement that has been classified as preservable and where cars are not permitted. The healing springs are one of the most important attractions ofSamothrace. There are two pools and 13 individual baths at the municipal Spa. One of the most important archaeological sites of Greece, occupying a verdant area of 50 acres with the very important monuments. Panagia Krimniotissa is a little church that is literally hanging in the air, offering a unique view towards Pachia Ammos beach. Vathres, which have made Samothace famous, are small ponds formed by the streams at some cavities of the mountain. Fonias river forms a lot of vathres and waterfalls. You get to the first waterfall in 30 minutes and to the last and tallest in approximately 4 hours. 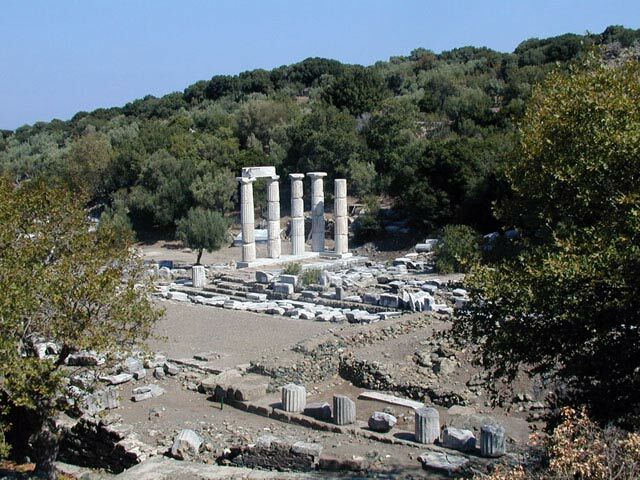 There is a daily boat from Therma on a tour of Samothrace, with stops at inaccessible beaches and natural attractions. 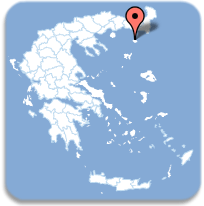 Welcome to the Samothrace page of Greece Vacation Search! Here you will find all the information you will need for your summer vacations on Samothrace. Subscribe to our newsletter in order to receive news, offers and updates regarding the Samothrace and all the other Greek islands.